Adoration of the Blessed Sacrament is personal or communal prayer before the real presence of Jesus Christ in the Eucharist. During Mass the priest invokes, calls down, the Holy Spirit to transform the bread and wine into the Body and Blood of Christ. It is by the power and grace of God that bread and wine are transformed. The bread still looks like bread, still tastes like bread, still has all the physical properties of bread, but it is substantially changed in the true Body of Christ through the power of God. The wine, likewise, appears the same, but is transformed substantially too. Some extra consecrated hosts are stored in the tabernacle, so that it may be taken to the sick and homebound. A special larger hosts is kept in small glass receptacle called a luna. The luna is placed in the monstrance that sits upon the altar or other suitable place so that it may be exposed during the time adoration. 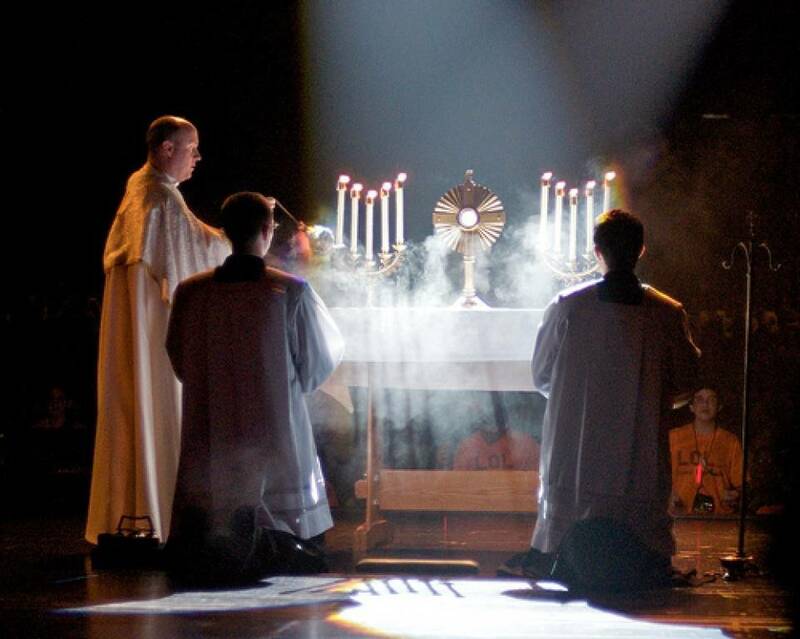 Adoration is a favorite way of prayer for many people. Although there can be a community liturgy planned around it, it is most often a personal and contemplative time of prayer. There may be a church full of people, but all are praying silently and contemplating God. Sometimes there may be soft music, scripture reading, and even a preaching. In the back of many missals found in the pews, there are prayers and songs often used when having adoration. If a priest or deacon is present, they may offer a special blessing upon the people using the monstrance, making the sign of the Cross with the Eucharist that is exposed in the monstrance. The name for this blessing is benediction. 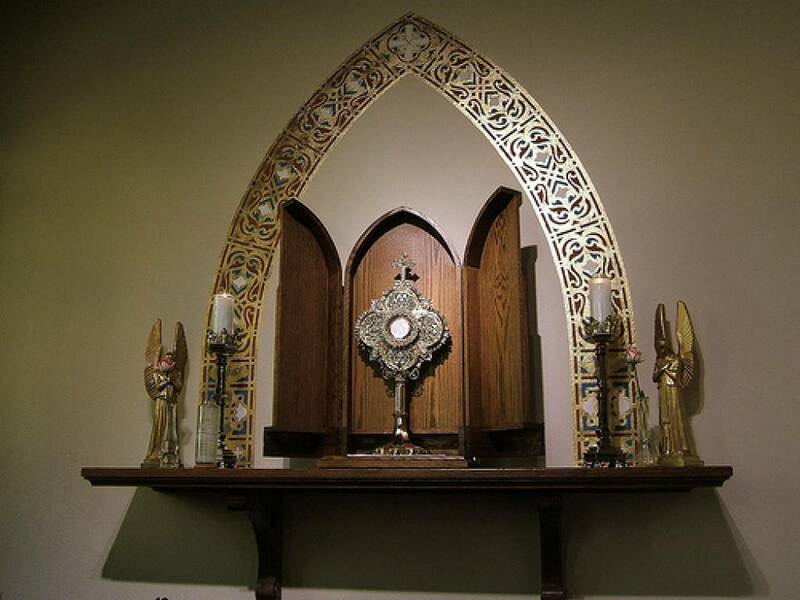 They will then repose the Blessed Sacrament and return the luna to the tabernacle. If no priest or deacon is present, a lay person would skip benediction and simply return the luna to the tabernacle. Whenever adoration is being celebrated. 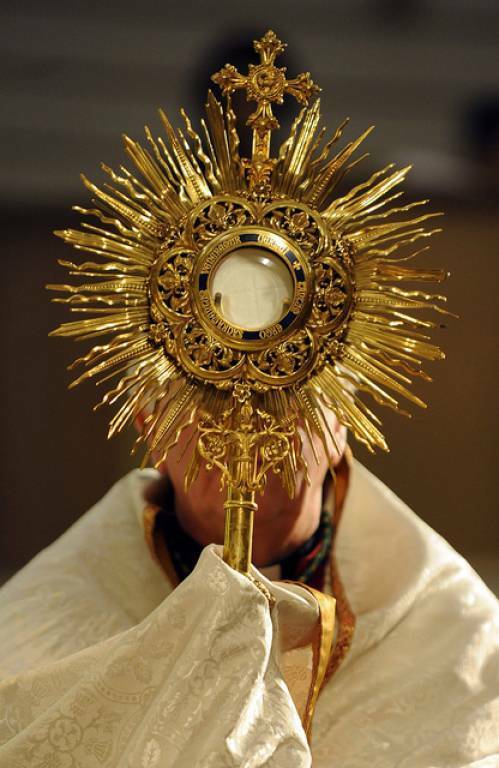 The monstrance that is exposing the Blessed Sacrament should never be left alone. If you are the last person and you are leaving, you should return the Blessed Sacrament to the tabernacle and leave the monstrance in an obvious open state so that others will understand that it has been put away.